As we began our first week in Masindi, I was fortunate enough to volunteer with the Red Cross of Uganda. For the past two days Stephanie and I have traveled to several different schools in the area to provide cholera education. 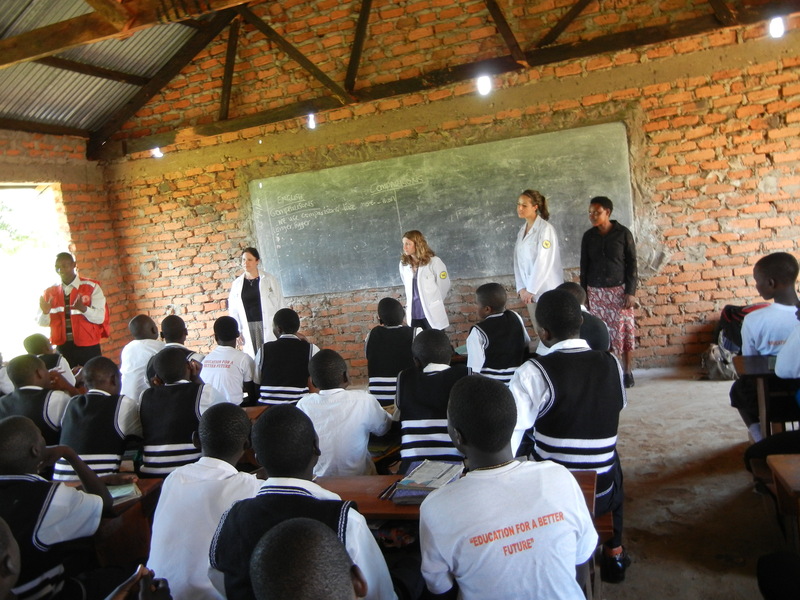 We visited two primary schools (grade 1-7) and two secondary schools (grade 9-12 and A levels). In Uganda, after grade 12 (known here as senior 4) students who are motivated to go to University must pass an exam to continue onto A level. If their scores are good enough in A level they can then move on to University. Although there is no current outbreak of cholera near Masindi, it is important for people to be educated about cholera, how to prevent it, and what to do if someone gets cholera. Making the session as interactive as possible, we spoke with the school kids about what cholera is, how it is transmitted, the signs and symptoms of cholera, causes, prevention, and treatment. The main focus was on good personal hygiene, drinking clean boiled water, proper hand washing, using the latrine, and eating clean, well-cooked food. The children were very respectful and we received very good participation from almost all of the grade levels (especially the younger levels). We were greeted by all the heads of the schools who welcomed us kindly. Although in Uganda they learn English in school and almost anyone who has had schooling speaks English, as foreigners we seem to have an accent. A member of the Red Cross accompanied us to the schools to help translate into the native dialect as needed (this was mainly only needed in the very youngest children). Mike and Ben will continue the education on Wednesday and Thursday in 4 different schools. Below is a video in which a student demonstrates near perfect handwashing technique. The only thing she missed is that all of the exposed skin on the arms should have been washed, but this was the best demonstration of the day! This entry was posted in Diseases/Health, My Safari (My Journey/Adventure) and tagged Cholera, good personal hygiene, Handwashing, Masindi, Pharmacy Students, Red Cross, travel, Uganda. Bookmark the permalink.